The music ministry of First Presbyterian proclaims to the world that God is a God of mercy, love, and hope. Our music ministry provides opportunities to lead our congregation in worship, service, and education while conveying God’s word through the words we sing, and the instruments we play. First Pres First Choice for Music! 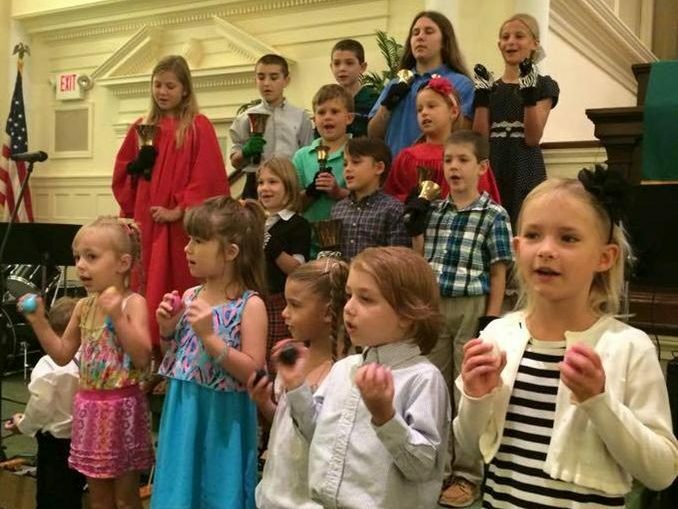 First Pres has many opportunities for all ages to worship through song. Our many ensembles also provide a special fellowship that can last a lifetime! Our Music Director conducts a special music class for the Mom’s Day out children. Drop-ins are welcome to attend the music session. Singing, movement, pre-reading skills, story time, and playing a variety of non-pitched instruments makes music time fun. Traditional and contemporary children’s Christian songs provide a wealth of resources. Children from preschool through grade 5 participate in music activities using singing, instruments and movement. They regularly participate in the worship service with their offering of praise through song. They use a variety of percussion instruments, ukulele, guitar and recorders to encourage music reading and to develop their musical talents. There is also a Christ Kids Ringers ensemble for hand bells. The Youth meet on Sunday prior to Youth group in the Golden Center. High school or junior high youth who are interested in singing or playing an instrument are invited to come and join. The Youth regularly share their praise with song during worship service. Resources include a variety of musical styles from classical to contemporary Christian. There are many opportunities to use your talents in a large group or small ensemble so come and join a great group of kids! High School youth are also invited to join the adult Chancel choir and Chancel and Chapel Bells. Anyone from high school age and up is welcome to join a wonderful fellowship of praise through song. No audition is required. The Chancel Choir regularly sings at the 11:00 service and special events throughout the year, such as the Jingle Java Jam in December, Disney Candlelight Processional, and combined performances with other church choirs around Polk County. Chancel Bells – Wednesdays at 6:00 p.m.
Chapel Bells – Thursdays at 7:00 p.m.
High School through adult ages are welcome. Both groups play regularly for Sunday worship services and for special occasions. We have space for beginners and advanced ringers. A commitment to a rehearsal schedule is required. We have a new opportunity this year for those who are interested in playing or singing contemporary Christian music. Musicians meet weekly to prepare music to be shared at our new Praise and Worship service on Sunday morning. Please contact our Music Director, Lynn McCoy, if you are interested in joining this group on a regular or drop-in basis. This is a new and exciting opportunity for musicians in our church. If you are a youth with three years band experience, an adult with instrumental experience, or a singer who is unable to commit to regular choir rehearsals we would love to have you join one of our small music ensembles. We use piano, keyboard or organ in every service and we welcome and encourage those with keyboard skills. There are opportunities every Sunday to share your talent during worship service. Please contact our Director, Lynn McCoy, and we will find a place for you to share your praise on Sunday morning. If technology is your thing, we also have a place for you in our musical praise! We are in need of people who would like learn about our sound system and help during the worship service to make sure all our praise is heard! We will be holding a training session so contact our Music Director, Lynn McCoy, and let her know if you are willing to join the Sunday rotation in the sound booth!